Deutsche Beteiligungs AG creates value for its shareholders by way of two business lines – providing investment services to funds and investing along-side these funds. The DBAG funds we initiate are the link between both business lines. They pool the assets of institutional investors and make investments in Mittelstand companies. We advise the funds in selecting, developing and, ultimately, divesting their portfolio companies or their interest. Employing the capital our shareholders have entrusted to us, DBAG invests as a co-investor alongside the DBAG funds. Both business lines contribute to increasing the value of DBAG. In Fund Investment Services, assets under management or advisement and earnings are targeted for long-term growth. The objective we pursue in the Private Equity Investments business line is to sustainably build the portfolio companies’ value. We seek, assess and structure investment opportunities, compile investment memoranda for the fund manager and negotiate investment agreements. We support our portfolio companies during the investment period of usually four to seven years as a financial investor in a focused-partnership role. In doing so, we pursue the objective of appreciating the companies’ value. We realise the value appreciation upon a portfolio company’s well-timed and well-structured disinvestment. The portfolio companies subsequently continue their development under a different constellation, for example, alongside a strategic partner from the industry, a new financial investor or as a quoted company. 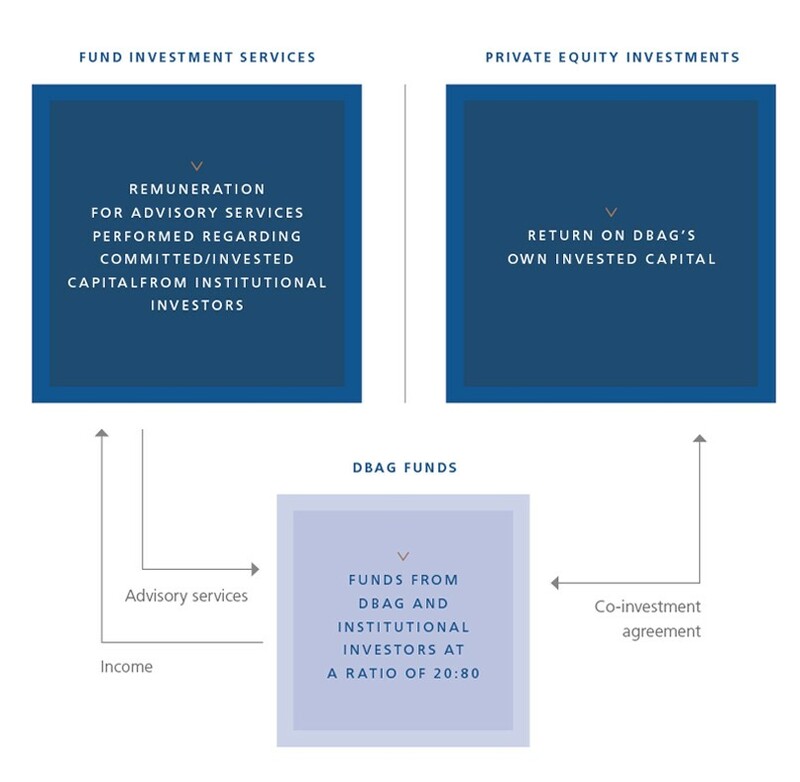 As is customary in the industry, DBAG receives volume-related fees for these investment services, which constitute a continual and readily forecastable source of income. The performance of Fund Investment Services is measured by sustainable growth in income for these services and by the surplus that results when income exceeds the expenses for the three phases of the investment process. The Private Equity Investments business line largely encompasses interests in mid-market companies. DBAG’s investments are held through investment entity subsidiaries. These entities invest at the same terms in the same companies and in the same instruments as the funds’ other entities do. To that end, DBAG has concluded co-investment agreements with the DBAG funds; these provide for a fixed investment ratio for the lifetime of a fund. Exits also occur in parallel to the agreed ratios. Earnings in the Private Equity Investments business line result from the value created within the portfolio companies during our investment period, which is realised upon their ultimate disinvestment. DBAG’s investment strategy derives from the strategies of the funds that are currently in their investment phase. These strategies can – generally when a new fund is raised – be adapted to the Company’s development or market changes.